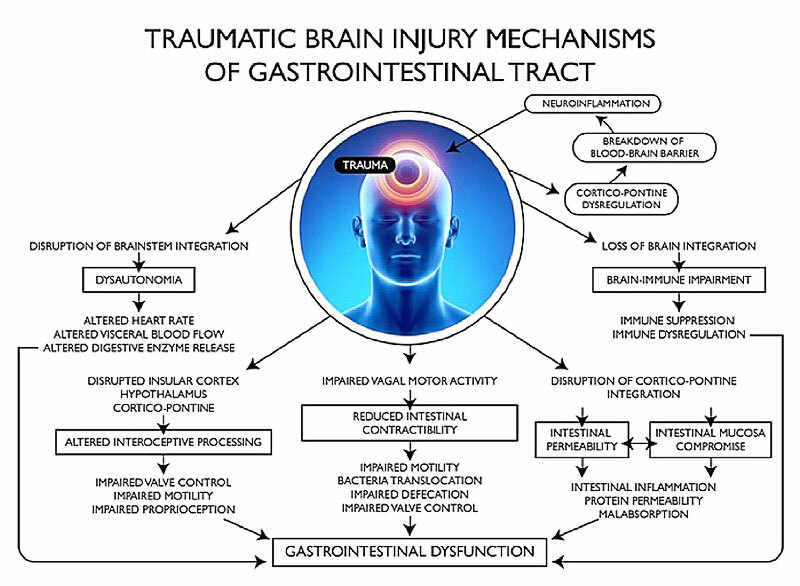 The editor of the scientific journal Alternative Therapies in Health and Medicine invited me to submit a paper for publication on the topic of “Traumatic Brain Injury and the Effects on the Brain-Gut Axis.” The paper was recently published and the abstract summary of the paper can be found on the National Library of Medicine and National Institute of Health at this link. Below is a summary diagram of the published paper. I have an incomplete spinal cord injury at the level of L1 that occurred 25 years ago. The hospitalization was complicated by sepsis and IV antibiotics including genta & Vanco. I have had major gut issues since including problems with a malfunctioning iliial cecal valve. I have had persistent gut issues which have been slightly helpedby the GAPS diet, which I have been on for over 3 years. I am reluctant to see yet another practitioner because most practice a type of bandaid medicine that does not help me. I need a good functional medicine doc in Tucson, AZ. Any suggestions? Thank you. Active H2 produces molecular hydrogen-saturated water that is a selective anti-oxidant that can pass through the blood brain barrier to help with brain trauma and neurodegeneration. It takes out damaging free-radicals but not those required for cell signalling. It will help in other areas too. April 2015 I suffered a brain concussion. This chart has me crying when I realize what the fall has really meant to my life over the past year and probably into the future. My thyroid figures changed. The Kaiser docs took me off Armours thinking I was going hyper. Not sure if it was the fall or the lack of T3 but my gut has been off (diarrhea) and the rectocele has dropped further, sometimes painfully so. The neurologist (not Kaiser) had me postpone surgery for the prolapse rather than introduce anesthetic to my brain. Is there anything I can do to reverse these problems? Pat; Hopefully you can see the bright side of seeing this chart, in that it gives you some clues into why your symptoms have been as they are over the past years. It can be a shock indeed, but a starting point to healing and empowerment. As far as reversing your problems, Dr. K can’t do diagnostics via the blog or email. He isn’t taking new patients or adding to his wait list at the moment due to an overfull schedule of teaching, research, writing, and treating his current patients. I’d recommend you look at the practitioner locator page (http://thyroidbook.com/practitioner-locator/) and contact someone from there. They are all highly trained in the protocols Dr. K uses, and some of them are willing to practice remotely. It will take more than one could do via blog/email to determine exactly what is going on for you, and how to work with it. Get on the horn to these practitioners, and keep up faith that you’ll find your answers. Pat, your comment makes me cry because I have had the same thing happen to me, only I didn’t realize it was a brain injury that was causing all my problems. It has been 5 years since my injury, and I have seen 8 doctors, not one of them mentioning I might have a brain injury. I have finally figured it out myself. I feel like I have brain damage, I can’t focus or complete things, and I believe I have SIBO. I finally figured out the right dose of thyroid medication, so that part is good, but for about 3 years straight I literally wished I was dead because of the depression and confusion I lived with every day. I am seeing a doctor on Dr K’s list of practitioners, but even they are not knowledgeable about treating SIBO or helping to heal the brain. I just wanted to tell you that you are not alone. I am 37 years old, and I have 5 young children, most of them can’t remember a time when their mom was not sick. I heard during a podcast with Dr Kharazzian recently that he was working on a book about SIBO. Does anyone know when that will be published? Thank you. Kristy; He is working on a SIBO book. No publish dates have been released yet. We all look forward to it! Alice; Yes, there are things you can do to work with brain inflammation resulting from a concussion. A qualified functional neurology practitioner should be able to help you. I’d try contacting someone from the practitioner locator page at (http://thyroidbook.com/practitioner-locator/). They are all highly trained in the protocols Dr. K uses, and some of them are willing to practice remotely. My teenaged son got a bad concussion two weeks ago. We have been to the pediatrician specializing in concussions, gotten treatment from an osteopath, and are about to start physical therapy. I have bought Dr. K’s brain book but what are the most important things for us to do right now? It sounds like time is of the essence – which supplements could help us most right now? P.S. We are in a small town not near any of the recommended practitioners. We may try to work with one remotely but just wondering about the best supplements for right now, two weeks post concussion. Mary; Good for you for jumping on this right away. Due to legalities here on the blog, I’d have to refer you to the info in Dr. Kharrazian’s brain book as far as the botanicals. If you can consult with a doctor, Kari Vernon (on Dr. K’s practitioner-locator list at: http://thyroidbook.com/practitioner-locator/) knows concussions well. She’s really great. Good luck! I’m very surprised Dr. K doesn’t talk about hyperbaric oxygen therapy for brain injuries. Surely he is aware of it. Mary; He is aware of it, and recommends it as a therapy for immediately after traumatic brain injury. My husband is a chiropractor who has suffered numerous concussions and brain injury and is suffering very much despite many different attempts and research and lots of anti-inflammatory supplements and a clean diet. Despite this we just found out he may have Crohn’s, he has inflamed ileum. He is starting on the GAPS intro diet but his brain function/ability has declined rapidly over the last week or so and am wondering if the meat stock/bone broth are aggravating his brain. I know glutamate buildup is common in brain injuries. Any good practitioners you would recommend would be helpful. He is currently doing hyperbaric as well but as of yet it hasn’t seemed to help. IT’s hard to get him to go see someone because he’s done so much research himself but I know we need an outside opinion because he’s not making it. We are located in the Boise Idaho area. Thanks. So sorry to hear your husband is suffering. Dr. Kharrazian has a practitioner locator page here: http://thyroidbook.com/practitioner-locator/. Some of them are willing to practice remotely, but you’ll have to contact them to find out who has openings. You might also contact Dr. Brandon Brock at the Cerebrum Centers in Dallas. Keep advocating for an outside opinion – it sounds like he really needs someone to triage the situation with him. Good luck to both of you, and keep us posted. Susan, is this list current and updated? Yes, the list linked above was expanded and updated very recently :D. The same list also resides on his brain book website, in case that’s where you hang out more: http://brainhealthbook.com/find-practitioner/.